While community gardens have been around for centuries, over the last decade or two they've been enjoying a great resurgence in popularity throughout Australia and beyond. 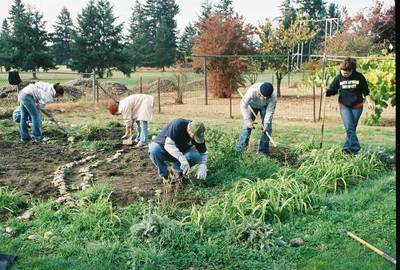 Community gardens are great places for city-slickers to get their hands dirty, and to try growing their own food, in the way that our forbears have since time immemorial. They're places where neighbours can meet and work together cooperatively, and where kids can learn about where their food comes from. Throughout Sydney, there are several terrific community gardens; some of which have been operating for many years while others are relatively new. Have you visited a community garden in Sydney. If so, which one? What was it like, and would you recommend a visit to others? Apart from working in the garden, what else is there to do there? Do they hold markets, gardening workshops and other events? What do you think are Sydney's best community markets? Newtown has a beautiful Community garden. I have also noticed one at Chester Hill. Will have to check those out! Thank you. Sydney is such a big place I'm sure there must be quite a few, and it's always great to learn some tips from the locals. Glebe community gardens has about 40 gardeners. What is the most spectacular waterfall in the Perth Hills?